witticisms: Summer Card Camp 2 Giveaway! Summer Card Camp 2 Giveaway! I love a good giveaway, don't you? Join your Online Card Classes Summer Camp counselors—Kristina Werner, Jennifer McGuire, and friends (including me! )—for a three-week adventure packed with cardmaking ideas! Each day, you’ll discover a new way to have fun with your cardmaking supplies, whether we’re exploring a color combo, transforming a design sketch, or learning a new technique together. 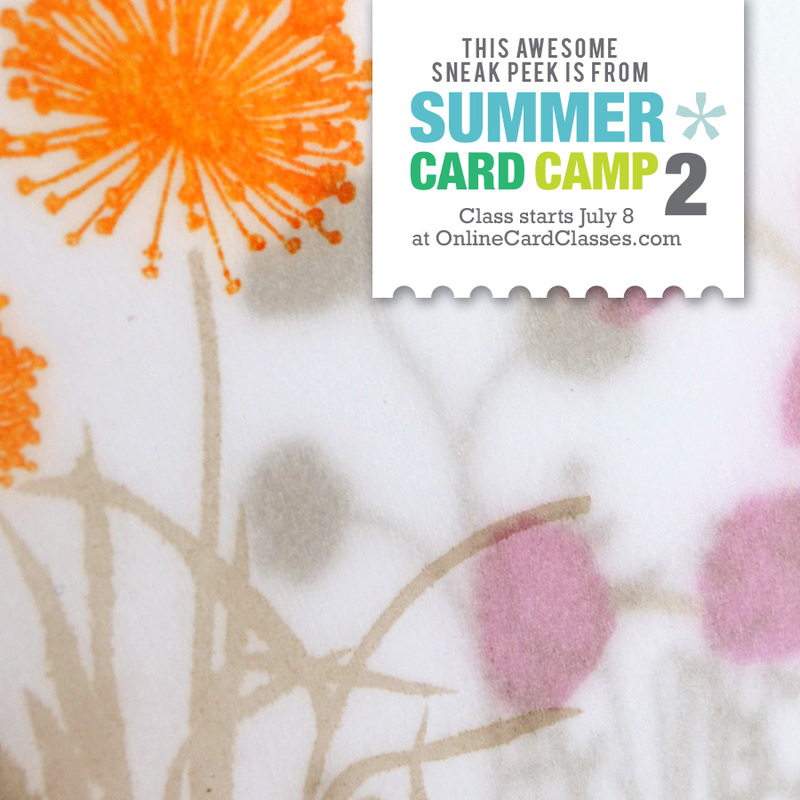 Summer Card Camp 2 includes designs from over 40 guest artists (yay! ), lively videos, PDFs containing step-by-step instructions, shopping discounts, and loads of giveaways! Plus, you'll have lifetime access to all of the class content - talk about making that summertime feeling last! Summer Card Camp runs July 8-29. Sign up now for only $35! I really love these classes... they're so well thought out and packed with tons of inspiration and ideas. Sooo... wanna give winning a spot at Summer Card Camp 2 a shot? Just leave me a comment today and I'll post a winner on Monday. This class looks very cool. Thanks for the chance. these classes are always so great - would love to win a free spot! Ooh - great timing on this! I'm on vacay for most of this month! Thanks for the chance to win! Have never tried a class from them, so this is very timely. Thanks for the chance to win!! I'd love to win!!!! I want to see the rest of your cute sneak peek! Would love love love to attend!!! Thanks for the chance to win, and thanks for all the great inspiration you share here. ohhhhh,I would love to win a spot!!! Thanks so much for the chance! Would love to win a spot. Thanks for the chance! Really excited for this class! Hoping to win! Thanks for the opportunity. I love all of their classes. Thanks for the chance to win! I played along the last time, and it was a ton of fun! - I'd love the chance to do it again this year :) Your card has me intrigued -- thanks for the opportunity! I've never taken an on-line class before, so it would be awesome to win a spot! The class looks like a lot of fun, and love the snippet of your card that you teased us with!! Oooh! I've never done one of these. It would be a perfect staycay activity! Would love to win a place. I would love a spot in this wonderful class! I just love these online classes..looking forward to it! Pick me! I love these classes too. Can't tell you how they've helped and inspired. me. Thanks for the opportunity to win a spot. LOVE all the online classes I have taken so far...so glad you are a part of it now too! Thanks for the chance to win a spot for free!! Love the sneak! Can't wait for this class!!! woo hoo! I'd love to win a spot. Thanks for the opportunity. Would love to win a spot. Can't wait for the class! I learn so much from them! Thanks for the chance to win!! Love these classes, and the inspiration is amazing! Thanks for the chance to win! This looks like such a fun class! Thanks for a chance to win a spot! Looks like a.great class! Thanks for the chance. You have a cool blog! I would love to win a place in the class! I would love to attend this class - thanks for the opportunity! Oh how I would love to win this! Looks amazing! Sure I would love to win a spot in the class....sounds so much fun! Love the idea of winning a spot in this camp! Fun inside, and out of the sun! I would love to win a spot. I took the most recent class (His and Hers) and have been so impressed! Thanks for the giveaway and have a great weekend! Ooh, ooh - me me!! I'd love a chance to win! Thanks for the chance to win!! I would really like to take this class! I can only imagine the fabulousness that will be going on! Thanks for the chance!! I'd love to win a spot in class, thanks for the chance. This looks like a fabulous class! Would love to win. Great sneak peek, Jess! Would love to win a spot! I've taken many - most--- of the online stamping classes and they are great. I'd love to win one! I'm sure this class will be fantastic. Thanks for the chance to win. Jess - this looks like it's going to be a great class. Thank you for the opportunity to win a free spot. There are so many awesome cards artists teaching this class. I would love the inspiration. Thanks for the chance to win. Love to a spot, thanks for the chance! This would be an awesome win...thanks for the chance. I loved the first Card Camp Class, so I know this one will be just as great! Sounds like great fun Jess. Count me in. Thanks, love your card art and projects. Thanks so much for the opportunity to win ~ this looks like a great class! I really enjoyed the last online class I took. I'd love to win this one! Thanks for the opportunity. I would love to take this class and see more of your sneaky peak! Thanks for the chance. Thanks for the chance to win! Looks like fun. I would love to be part of this class! Looks like fun! Thanks for the chance to win!!! I'd love to win a spot in the class! Thanks for the chance! Oh wow Thanks for the chance to win a spot in this class. Your card looks very interesting! Sounds like fun! Thanks for the chance to win. I took the first class and it was amazing! So much info & inspiration. Loved every minute of it! I was part of card camp last summer and really enjoyed it. Thanks for the chance to win a spot this year! I'm dying to take this class! I've entered a couple giveaways and not won. This time maybe? Pretty please?? :) sounds awesome!! I would live to win this class. Looks like a lot of fun! Thanks for the opportunity! Would love to try this out.